With the development of injection molding, the vacuum-molding lunch box is gradually replaced by injection molded box which features one-step molding, no secondary operation, good seals and beautiful appearance, etc. Based on huge market demands, Tederic Machinery developed perfect automatic lunch box injection molding solution with shortend cycle time, more cavities and stable quality. According to lunch box and mold properties, Tederic uses its own patented and core techniques one-cylinder in-line type injection, high intensity clamping unit and high rigid frame structure for D-MF series, ensuring precise injection and mold open and clamping positions , with little mechanical deformation to significantly increase product’s repeat accuracy. Tederic and mold makers are concentrated on research and development of IMM and one mold with cavities. Due to their concerted efforts, now it’s four , eight or more cavities . Since from one or two cavity molds at the beginning. For example, D610/M2500F Fast machine producing 1*8 takeout containers on 2016 ChinaPlast Expo. D-MF Series using high efficient servo system and high plasticizing screw to significantly increase its response ability, shorten plasticizing, injection and dry cycle time. For example, D610 produces 1×8 32oz lunch boxes, 5.8s cycle time for demo and 6s for stable production. 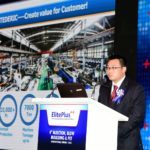 Tederic is researching and developing automat packaging and sealing system and providing overall plant automation production project for users in accordance with market demands, presently most takeout container producers use robot to automatically grab, stake and centralized packaging and sealing.